There are many reasons you would want to track moon phases. Some people do it for lunar gardening while others pay attention to moon phases for religious purposes. 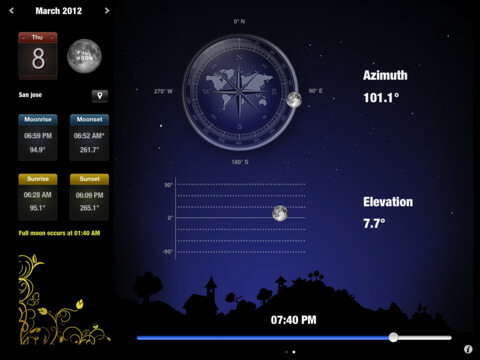 The good news is you can use apps such as Moon Calendar to get this information on your tablet. Moon Calendar combines a beautiful user interface with useful data on the Moon and Sun to save you time. Moon Calendar has a beautiful user interface. It displays moon phases in an easy-to-follow fashion. You can change time and location in the calendar easily. Moonrise, Moonset, Sunrise, and Sunset times are also included. Want to find out when Full Moon or New Moon happens? Moon Calendar provides you with the exact time. It covers the elevation and azimuth of moon as well. 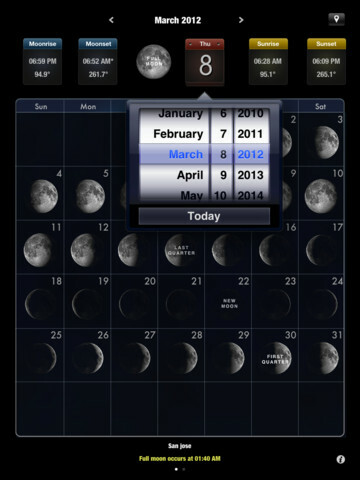 Moon Calendar allows you to save multiple locations. 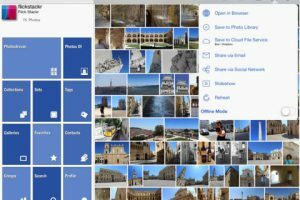 You can search for locations by zip code, street address, and co-ordinates. 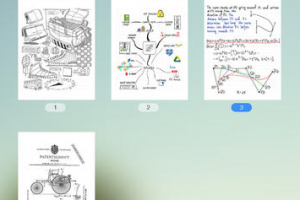 The app works fine on iPhone but we preferred playing with it on our iPad. Regardless of why you want to keep up with moon phases, Moon Calendar can save you some time getting the information you need.